We love you baby girl and miss you so very much. We had a birthday party for you today. The kids played with your balloons and ate a cookie cake with your name on it. Aunt Bobbie and Carla had a birthday party for you in Texas also. They all ate an enclair in your honor, lol. I know you had the best birthday party ever up in heaven with Jesus. I'm sorry to be so late to send my wishes to you but they are sent with love in hopes that you had a Happy Birthday. I'm sure our angels blessed you with a glorious celebration all in honor of you on your special day. 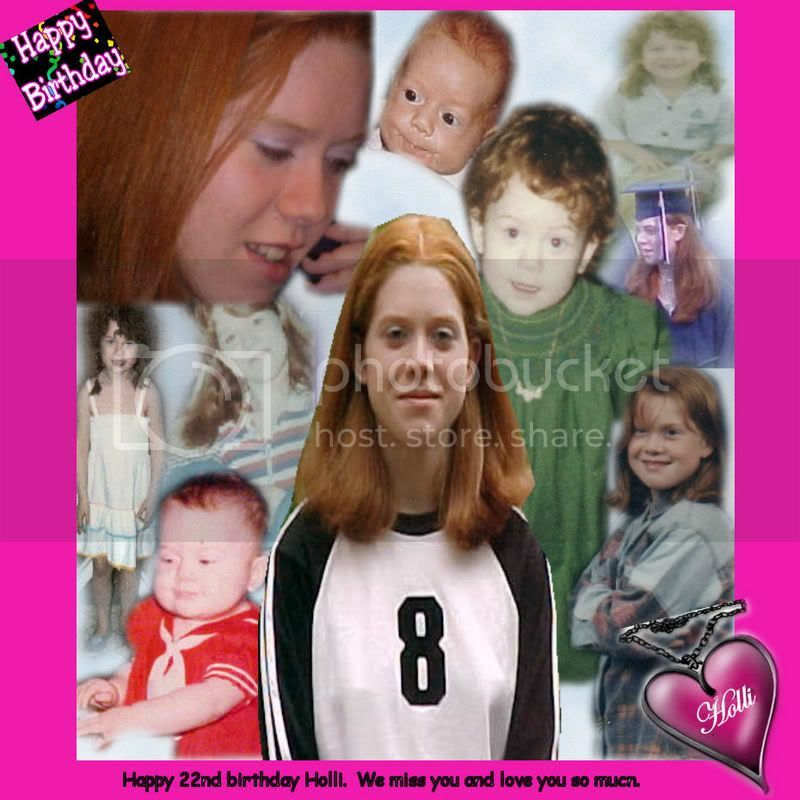 Wishing you a Happy Birthday in Heaven Holli. Hope there is a great celebration with all our angels. Holli We wish you were here everyday and today is just a lot more special I remember the day you were born You were so small and your mother was so proud to be holding you. A Girl in our family the first and the only baby girl. Hey Tammy sending you my prayers today on Holli's 22nd Birthday..
Just stopping by to wish Holli a peaceful birthday is heaven. Tammy, I hope u feel Holli's presence with you on the 9. Try to remember kind thoughts and warm memories of Holli. I hope the person that hit her still thinks about it and remembers what their action's cost someone else. I'm sorry for your loss, God's gain, is all we can tell ourselves. You are an inspiration to me. I love my only son so much. I don't know what I would do with out him. I will pray for Holli, you and your family. God bless you. Im truly sry. I hope that someday ur family can be at peace. I really know how ur feelin, In 99 i lost my bestfriend Nikki to drunk drivin. I was the driver. It eats me up everyday. We were only 16 yrs old. Nikki dies in the air flight beside me. Her family has been great to me, they have never blamed me. I have to live with the fact that i decided to play God and that it wasnt right. I didnt get any charges due to her parents sayin that I got all the punishment i needed. I wasnt able to go to nikkis Funeral or callin hours, due to they didnt think I was goin to make it. i never got the chance to say goodbye or that i was sry. There was alot more to the accident there was a othe car with friends the other car was drinkin and drivin too, he fishtailed and hit my car causin me to lose control. The other driver was a friends boyfriend and was 23yrs old. he is now in jail and severin 10 more years. Becuase he was the one that brought the beer for us. I know that what i did wasnt right and that i miss her everyday. due to this event Im not a drinker now and I hate to hear of people even havin 1 drink and then driving. i donate money to the MADD program... I know it will not chage what I did but it will help others. Recently i lost my baby bro to sucide. he was my other bestfriend. i blame myself for that too. Losing someone dear to you is a huge thing to deal with. So not only have i lost one but i lost both. After chris pasted, I wondered if God was punishin me for the wrongs i did. Im still deallin with these issues. My parents arent very helpful. they only deal with there pain and sorrow.... im sorry that her friend isnt takin reponsible for his actions. Its not right. I truly feel sorry for him. believe me it will eat him alive, maybe not to taday or this year but it will.........Try to make something good out of this, be Holli's voice now. never let her be forgotten. She will always be yalls lil girl and no one can ever take that way for you guys. NO ONE. Not even that guy. he may of takin her away, but he will never beable to take your memorys away. Tammy, stopping by to visit your sweet Holli and to wish you both a Merry Christmas. I pray the days are peaceful to you. Tammi, just stopping by to wish you a peaceful and safe Christmas filled with love and wonderful memories of your beautiful Holli.